If you didn’t stay up late enough to catch all the Maine candidates’ remarks Tuesday night — or in some cases Wednesday morning — we have you covered here. The BDN had reporters at many of the candidates’ election night events and posted videos of their remarks live on Facebook. We’re including those videos here for easy reference, as well as links to speeches broadcast by other media outlets or written remarks released by candidates themselves. Incumbent U.S. Rep. Chellie Pingree, D-Maine, declared victory in a speech delivered at Aura before midnight, when she held nearly 60 percent of the votes counted at the time. Coming in a distant second was Republican Mark Holbrook, from Brunswick, and pulling in third in the three-way race was independent Marty Grohman of Biddeford. 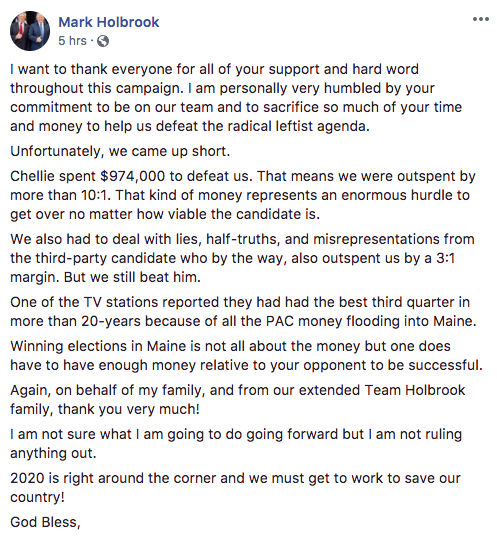 In a written statement posted to Facebook Wednesday morning, Holbrook acknowledged the loss, pointing in part to his funding disadvantage compared to his two opponents. In his written statement, Grohman said he called Pingree election night to concede the race, and he continued to push for less partisanship in Congress. In the neck-and-neck race between incumbent U.S. Rep. Bruce Poliquin, R-Maine, and Democratic challenger Jared Golden in the 2nd District, there were no victory speeches nor concession speeches on election night. As voting results continued to trickle in early Wednesday morning, the two candidates each addressed supporters — Poliquin in Bangor and Golden in Lewiston — to thank them and pass along words of encouragement heading into the coming days. Using ranked-choice voting, the second choice votes of two independent candidates will be redistributed to the major party candidates, and ultimately decide the winner. Independent Tiffany Bond gets points for the most amusing election night remarks, as expressed through a running series of laugh-out-loud social media posts, which can be accessed through these gems, linked here. Incumbent U.S. Sen. Angus King, I-Maine, cruised to victory over Republican Eric Brakey and Democrat Zak Ringelstein. Click here for video of King delivering thanks to his supporters in Brunswick, as broadcast live by Portland ABC affiliate WMTW just before midnight. Ringelstein can be seen in a short election night video speaking to supporters in Portland in this Tweet by WCSH 6 reporter Cameron O’Brien. We began this campaign with the simple idea that a public school teacher could be in the US Senate. That billionaires and corporate lawyers and career politicians are not the answer; we, the working people, are.